The rescue operation in progress. 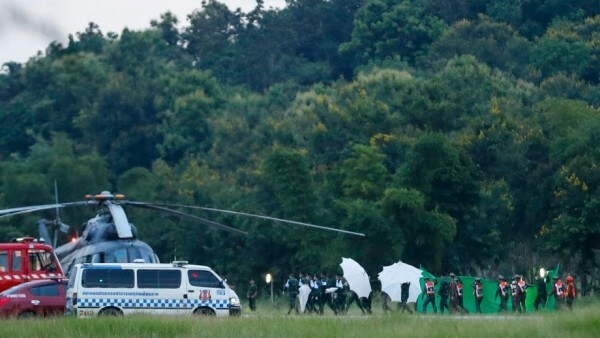 All 12 boys and their football coach have been rescued from a flooded cave in northern Thailand after being trapped for 18 days, bringing an end to the ordeal that prompted a huge international rescue effort. The coach was one of the last to be extricated from the cave on Tuesday in the rescue operation that began as a local search for the missing but turned into a complex mission, involving hundreds of experts who flew in from around the world to help, CNN reported. The 12 young footballers, aged between 11 and 16, and their 25-year-old coach went missing in ThamLuang cave in northern Thailand’s Chiang Rai Province on June 23. The boys were found inside the cave by British rescue divers a week ago, about 4 km from the cave mouth. They belong to a football club called the Wild Boars and were trapped during an excursion with their coach. Thirteen foreign cave diving experts and five Thai Navy rescuers joined the first operation on Sunday that brought out four boys from the cave. Rescuers spent about 11 hours on the mission. Another four boys were extracted by the same team on Monday. The remaining four boys and their coach were rescued on Tuesday and were sent to hospital by helicopters. They underwent X-rays and blood tests and will remain under observation in the hospital for at least seven days. After the successful and perilous rescue mission, it would take some time for the divers of the rescue team to evacuate from the cave. After their evacuation, the cave would be closed, according to Thai rescue operation officials. The eight boys extracted on Sunday and Monday were being treated in hospital and were in good condition, according to hospital sources. Chinese volunteer divers who joined the rescue mission called it a “tremendous and very dangerous operation”.